At next Mondays Preservation Board meeting, the owner of the building that former housed the Original Cast Lighting Company will seek approval to demolish almost half the building to create a surface parking lot facing Delmar Boulevard. He will almost certainly argue that he needs the parking to serve the remaining portion of the building which will be renovated for retail space. The red brick portion in the photo above is what would remain, with the parking extending further out to the front property line which is just beyond the row of planters. 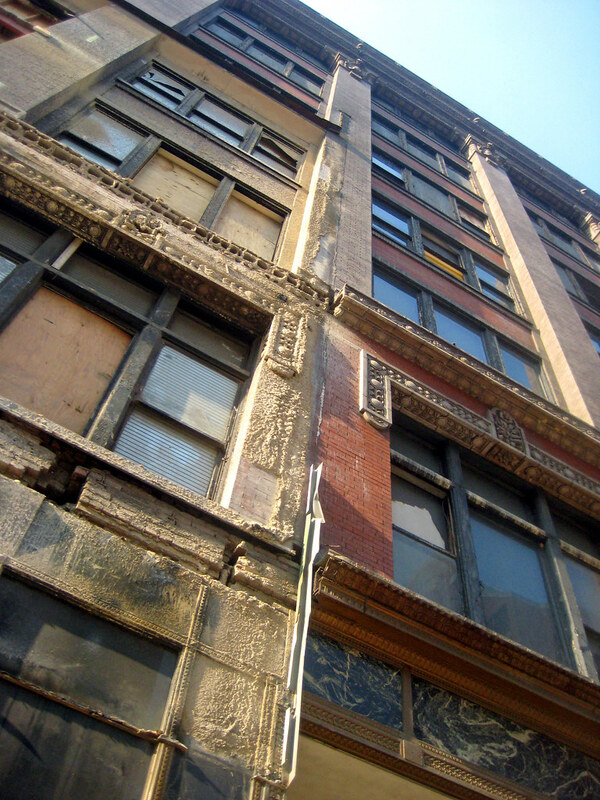 The portion of the building that would be demolished shown above is not considered historically significant to Skinker DeBaliviere Historic District. The issue here is not one of preserving historic architecture, but rather one of planning and urban design. The Skinker DeBaliviere Historic District Committee, of which I am a member, opposes the parking as proposed, but would accept it if the existing front wall of the building was retained or a new wall of equal height built to screen the cars and continue the street wall. My personal opinion is that the new parking lot is not needed. 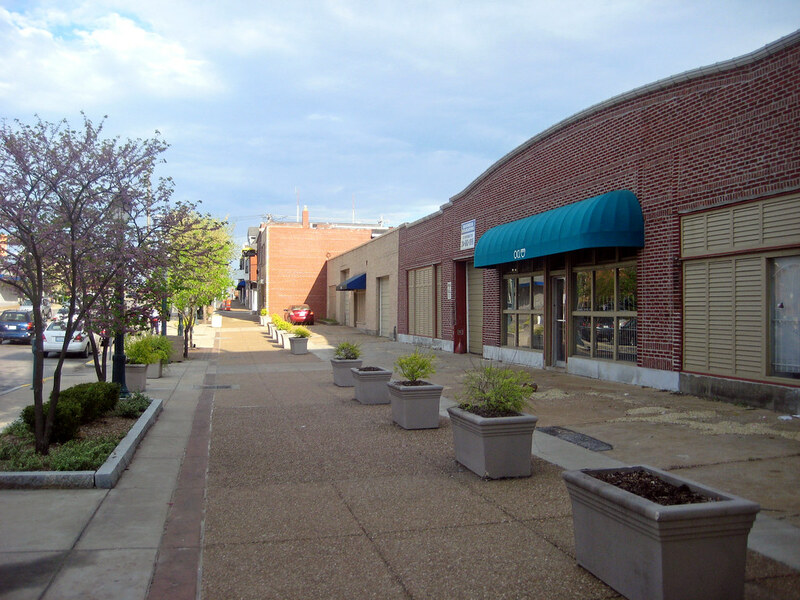 The portion of the Delmar Loop that is in the City of St. Louis is already well pock-marked by holes in the street wall of buildings on both sides of Delmar. The areas shown in magenta above are surface parking lots, including two auto oriented businesses that are largely paved with asphalt. The yellow indicates vacant lots and the cyan is the site of the proposed parking lot, which by the way is just a few hundred feet from the Delmar MetroLink station. 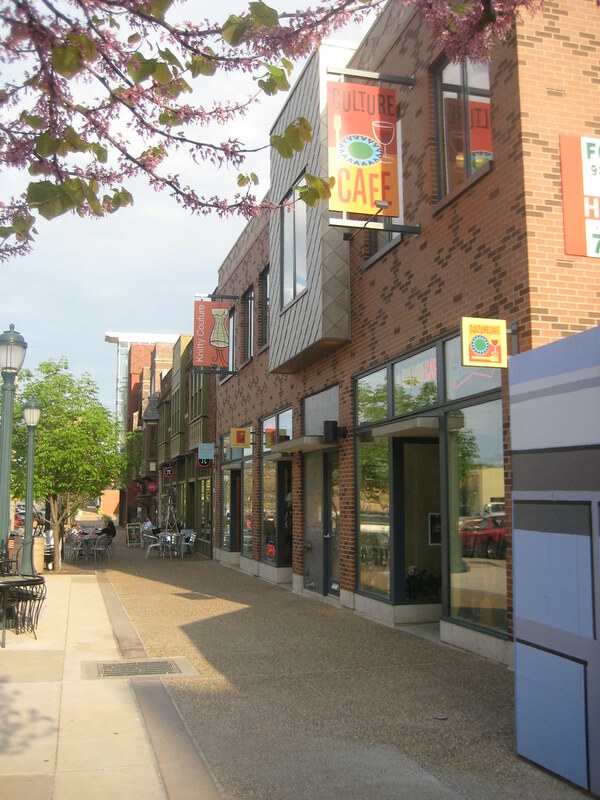 Above is a row of buildings that have been developed by Joe Edwards containing retail and restaurants. None of the buildings including the new construction in the foreground contain dedicated parking except for a few spaces off the alley for employees. The retail tenants, including the very popular Pi restaurant rely on the vast pool of parking north of of the Pageant Theater and Moonrise Hotel. Metro allows overflow parking in their park and ride lot at night. A well lit walkway decorated with sculptures alongside the Pageant connects the parking pool to Delmar. 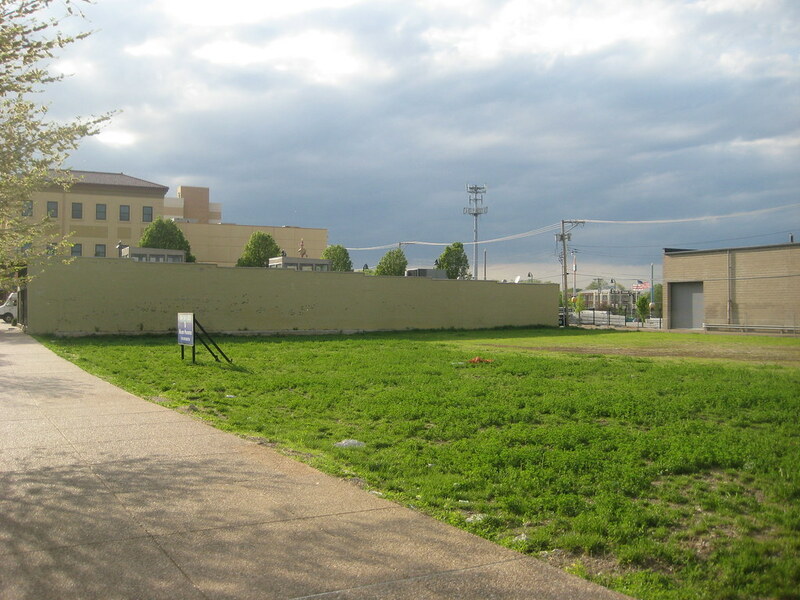 The owner who is applying for the demolition permit for the new parking lot also owns this large vacant lot across the street. 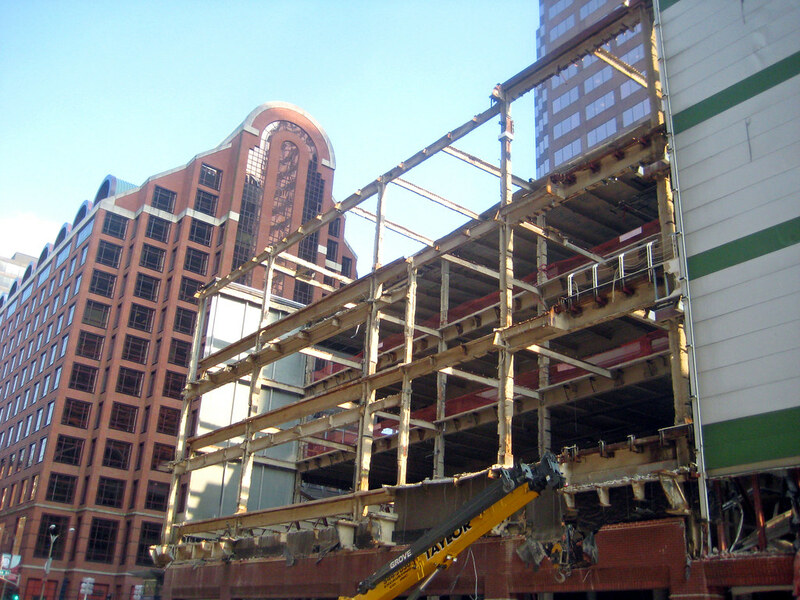 It was the site of the Yellow Cab company, a funky spaped building that will be the subject of a future post. He had proposed a new retail and office building but when the economy crashed, apparently so did the project. The asphalt expanse of the Churchs Chicken at the corner of Delmar and Skinker, just one of many "holes" shown on the map above, interrupts the continuity of the East Loop area. 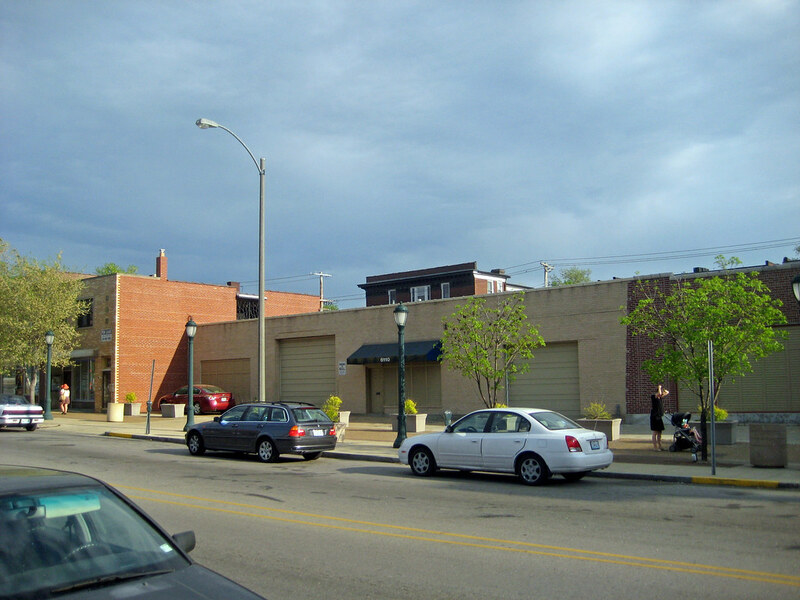 The proposal includes removing a sliver of the back of the remaining building to create employee parking of the alley. This is a good solution which should be continued across the entire building instead of demolishing it for the oversized parking lot. 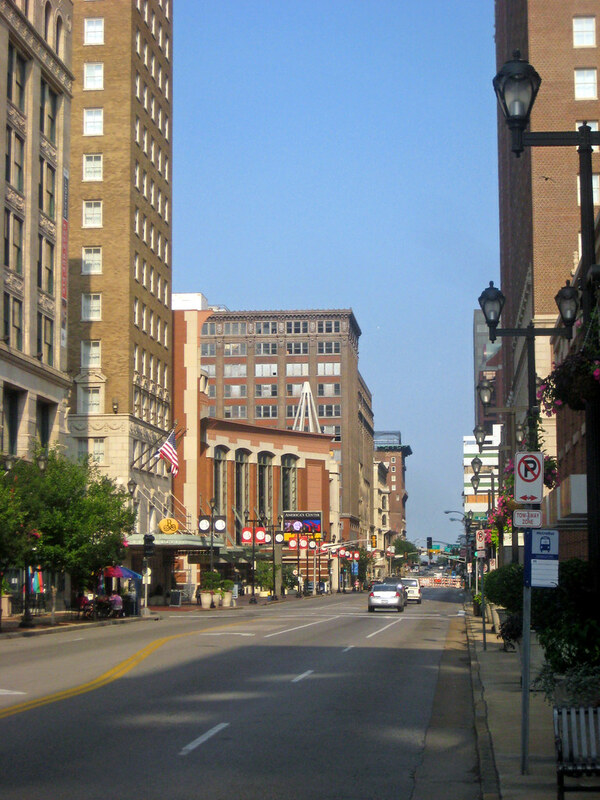 St. Louis' zoning code is allows the first 7,000 s.f. of retail space in this type of commercial area to have no dedicated parking, so a variance would likely be unnecessary. 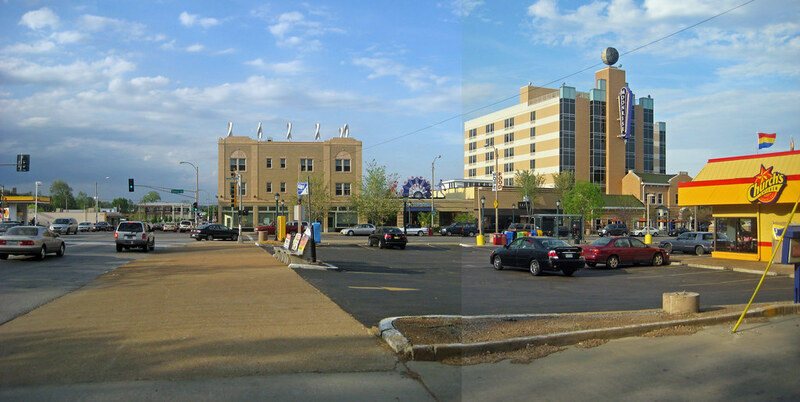 This week, exactly a month after the Bridge Bash, the St. Louis Centre sky-bridge over Washington Avenue is completely gone. Looking from a few blocks west, it is almost hard to believe that it ever existed. The westbound lanes of Washington Avenue are now reopened. The eastbound lanes are still blocked as demolition crews still work on removal of the half bay of the mall that extends over the sidewalk on the south side of Washington. The former Stix Baer & Fuller (Dillards) building is now completely free of the former structure. 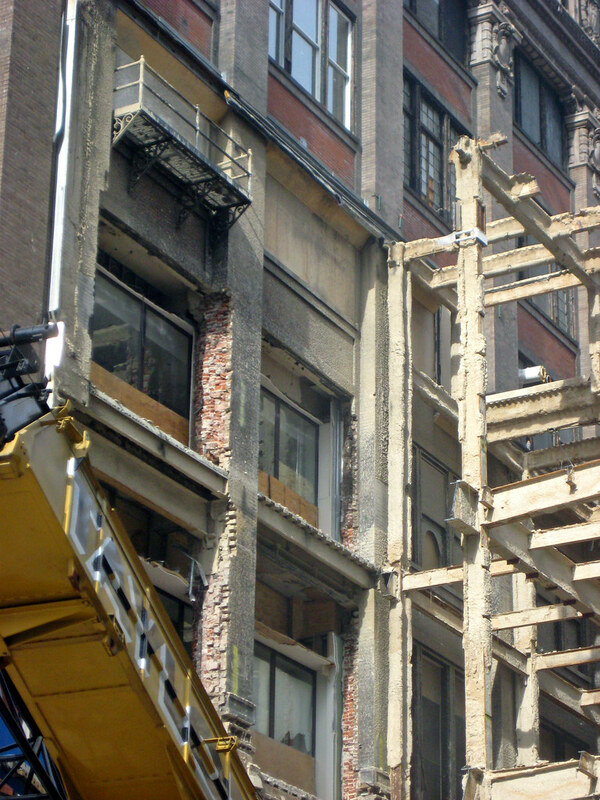 It's facade awaits restoration as part of the Laurel project which is now underway to convert the building into a hotel, apartments, and ground floor retail. The view east however is still marred by the final barrier between Downtown St. Louis and the riverfront. Check out City to River's recently added page to see what you can do to help remove this last obstacle to reopening our City's front door. 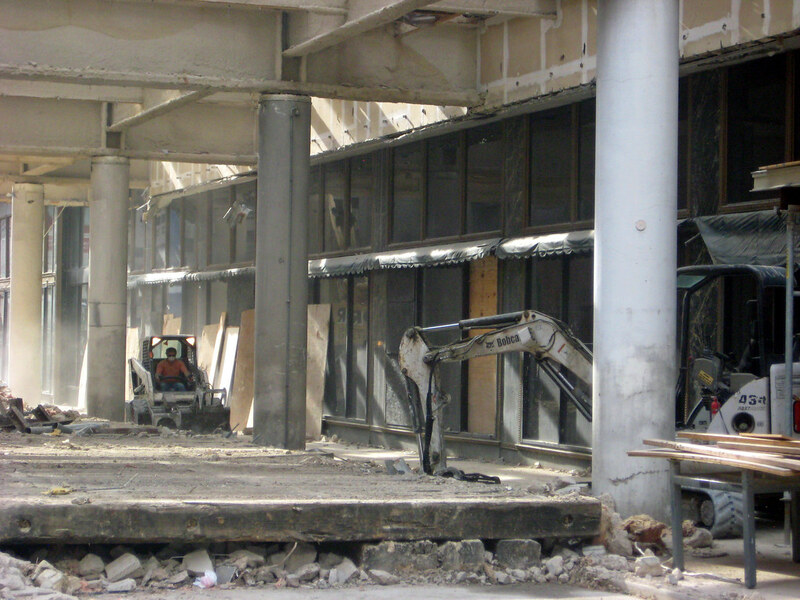 The gaping wound in the former mall building. Scar tissue on the Stix facade... fortunately all reparable. A few weeks ago before the Central Library closed for its 2 year renovation I was there thumbing through a box of articles looking for items on St. Louis Centre when I ran across this. 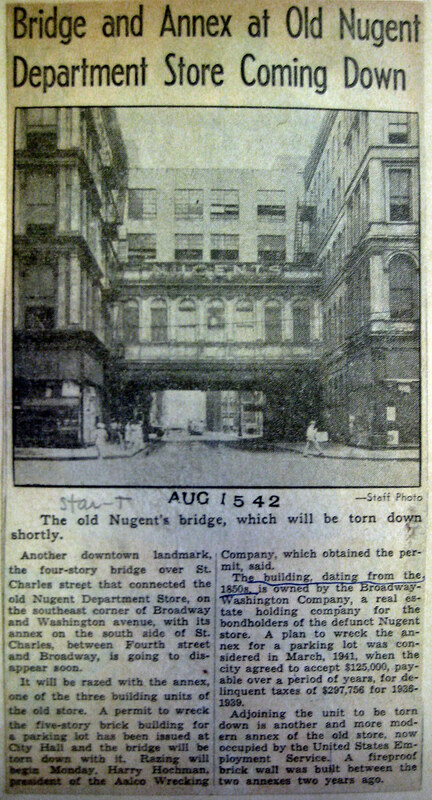 Several decades before St. Louis Centre would darken Washington Avenue and Locust Street, another multi-story bridge was constructed over St. Charles Street to connect Nugent's department store with its annex to the south. Nugents was located at the southeast corner of Washington Avenue and Broadway. 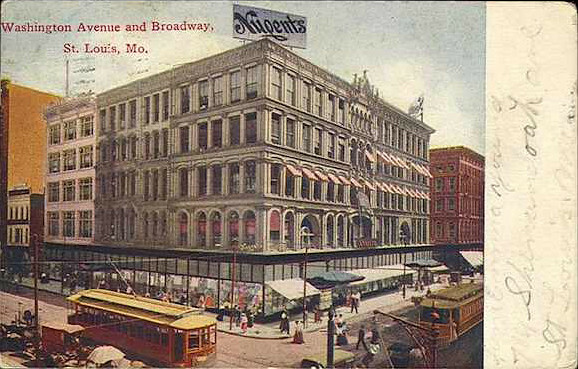 Occupying five floors on half a block plus an annex of at least equal size south of St. Charles Street, Nugent's was one of several medium size department stores in Downtown that were contenders amongst the big three (Stix Baer & Fuller, Scruggs Vandervoort Barney, and Famous Barr). Economic forces of the depression however caused Nugent's to close its doors in 1933. 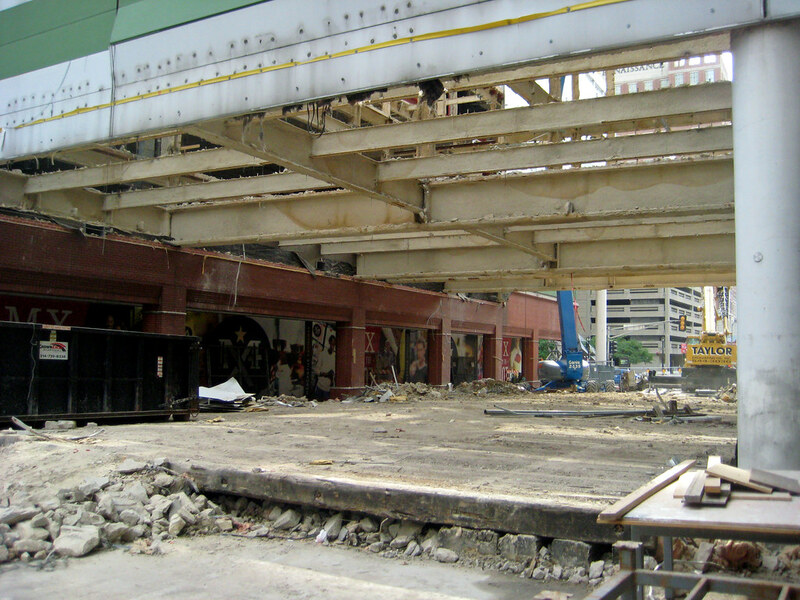 While Nugent's and it's four story bridge are long gone, and several of Downtown's many bridges that connected warehouses have been demolished over the years, a few survive, including one near St. Charles and 11th Street and one connecting to City Museum. 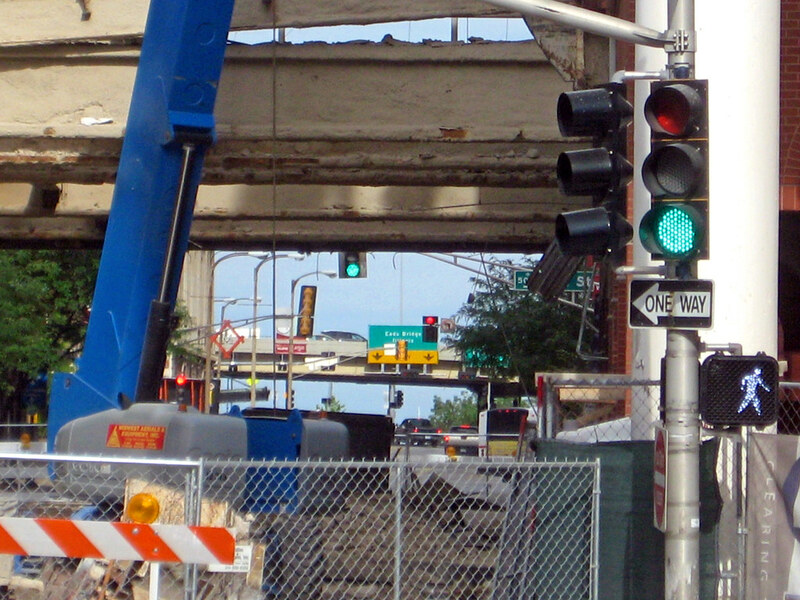 Not as much progress has been made in the removal of the St. Louis Centre bridge over Washington Avenue in the past week and a half as I had imagined. 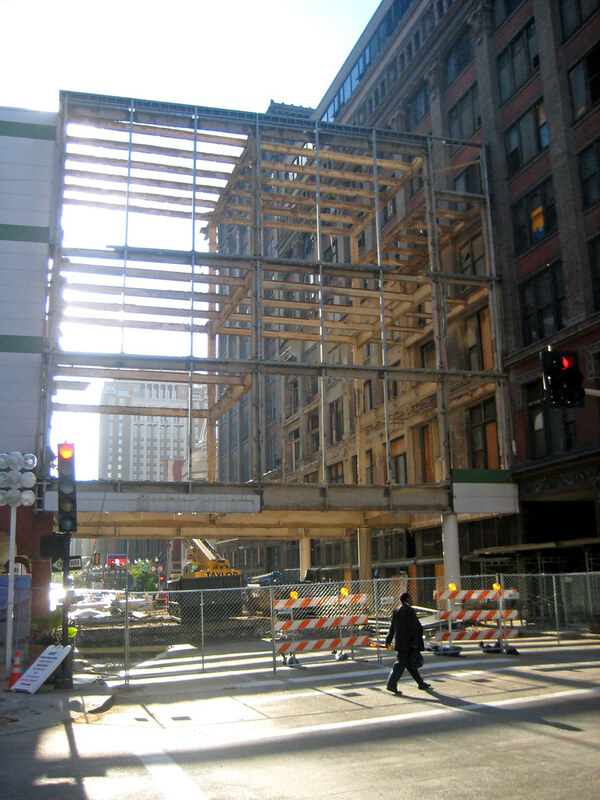 A three story grid of steel beams still hovers over the street, although in this view the progress of cutting away the grid is a bit more evident. Would New Yorkers Tolerate "The 5" on 5th? On Friday City to River published a blog post imagining what it would be like if there was a highway running down the middle of Michigan Avenue in front of Millennium Park in Chicago. This was compared to section of the soon to be former Interstate 70 as it slices between Downtown St. Louis, the Gateway Arch and Laclede's Landing. This made me think of another location where a highway dividing a city from one of it's crown jewels would likely be met with expletives. 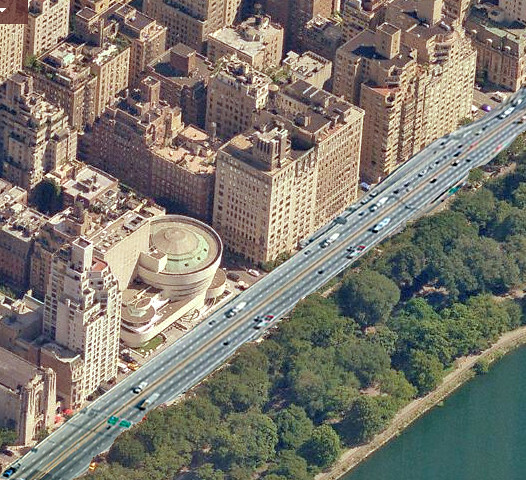 How would New Yorkers feel about an LA style freeway plopped down on top of 5th Avenue along Central Park? Would they tolerate "the 5" on 5th? 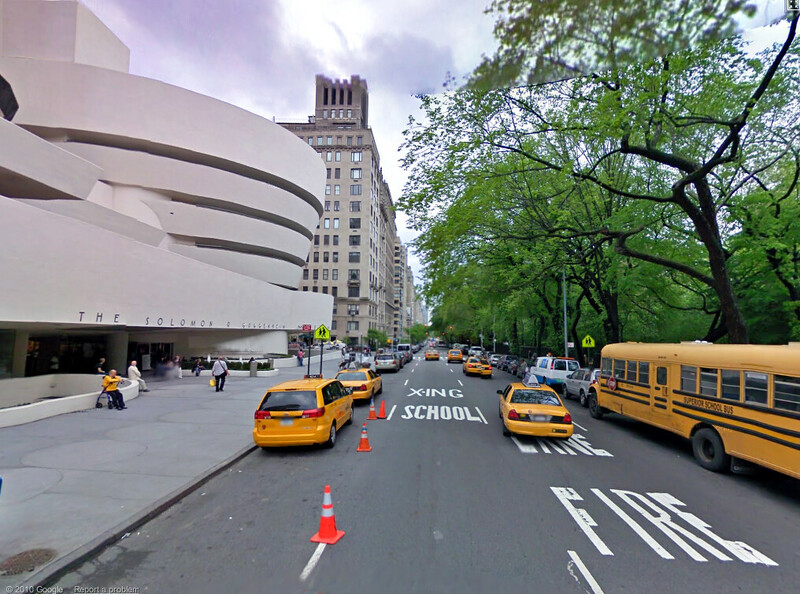 5th Avenue along the edge of Central Park at the the Guggenheim museum. The Solomon R. Guggenheim expressway. You might be saying to yourself, "this is pretty ridiculous", right? Well yes it is, but it is a reality here in the Gateway city. City to River thinks it is pretty ridiculous that we have a highway separating Downtown St. Louis from the Arch and riverfront districts to the north and south. Instead of a freeway separating us from the riverfront, we should be a boulevard providing connections throughout the area. In both of these examples, Chicago and New York, some of the most expensive real estate in the city is located along the great streets such as Michigan Avenue and 5th Avenue. 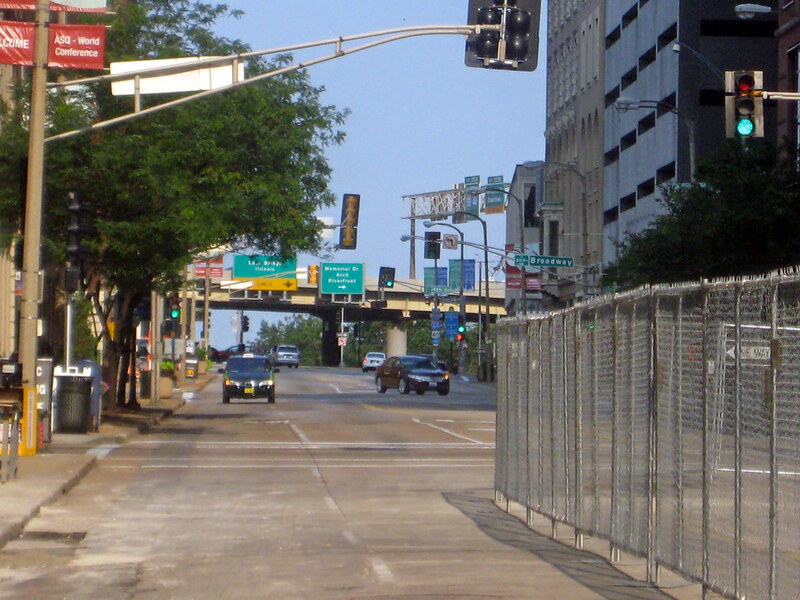 Here in St. Louis however, the highway caused development to turn its back on the only urban national park outside of Washington D.C. Additionally apart from for a small spurt of renovations in Laclede's Landing in the early 1980s, development in the riverfront districts flanking the Arch has stagnated for decades. 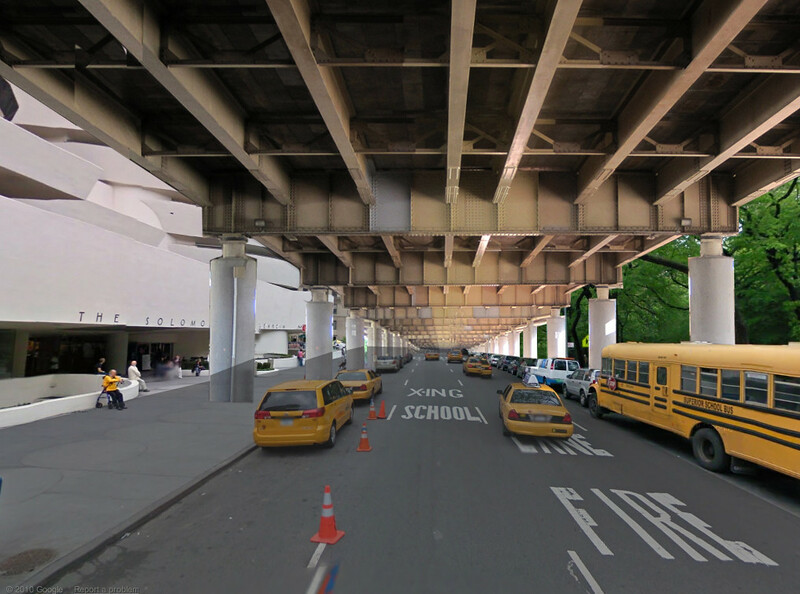 This morning, City to River is publishing another post detailing the enormous potential for development that will be created by removing the highway and replacing it with a boulevard. This would continue eastward the momentum of $4.5 billion that has been invested in the core of downtown St. Louis over the last decade. Only then will Luther Ely Smith's vision of a revitalized St. Louis riverfront be complete. The Post-Dispatch has also picked up the story here. 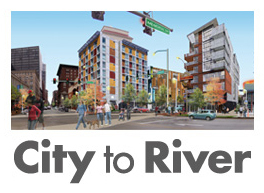 Also, be sure to check out City to River's website, as several pages have been added and updated. The view down Washington Avenue is beginning to unfold. 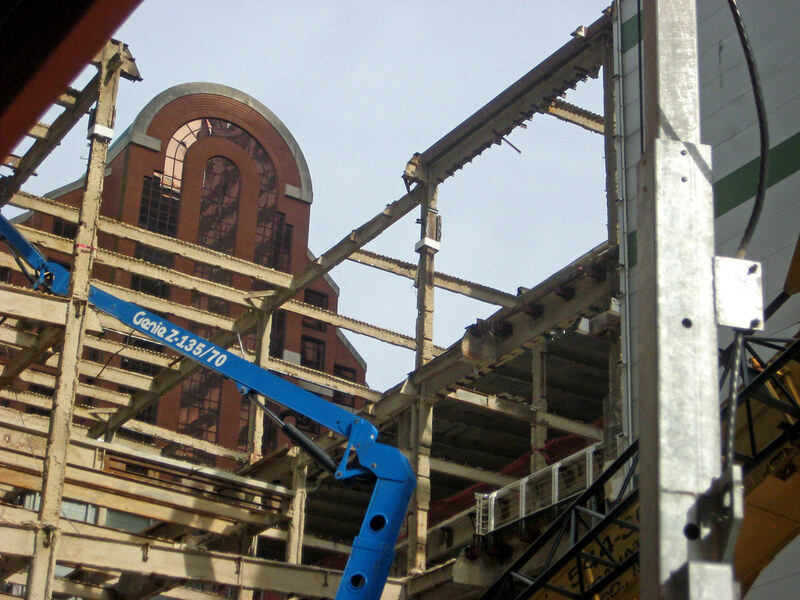 With the glass and skin gone, the super-structure is beginning to be cut away from the top. While the view down Washington will be vastly improved, there will still be one more barrier at the end of the Avenue. 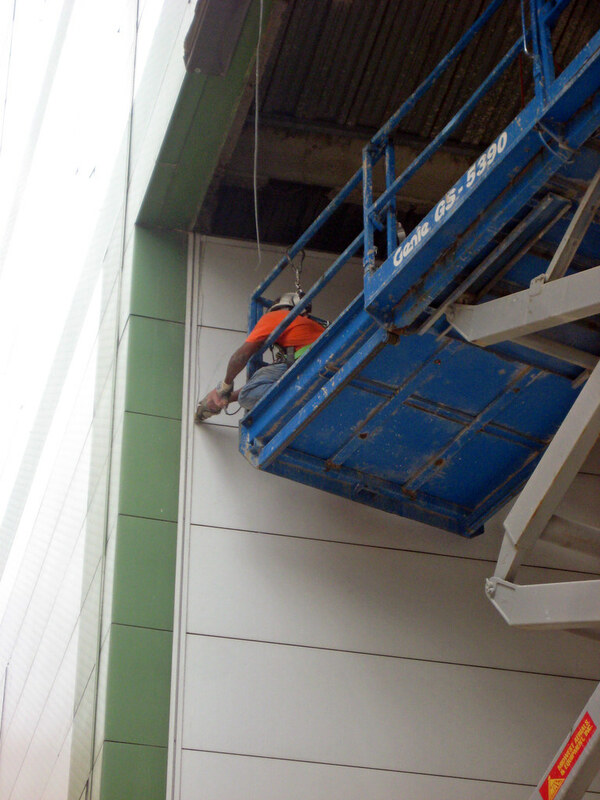 A worker cuts through the insulated metal panels of the mall with a saws-all. A close-up of the former entrances to Stix Baer & Fuller (Dillards). The small balcony revealed near the former bridge roof level. It was possibly a fire escape, but historic photos do not appear to show connecting stairs between the balconies. The portion of the mall over the sidewalk is also being removed. A view of the remaining bridge structure from the east. Daylight! 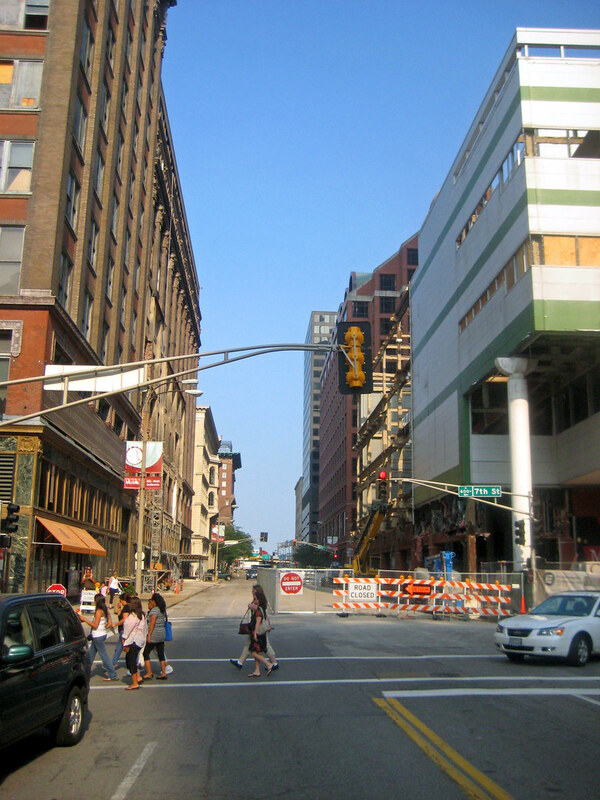 A very refreshing sight on this stretch of Washington Avenue now that the floor structures have been removed. sunlight strikes the awnings of the former Stix Baer & Fuller department store building for the first time in over 25 years. 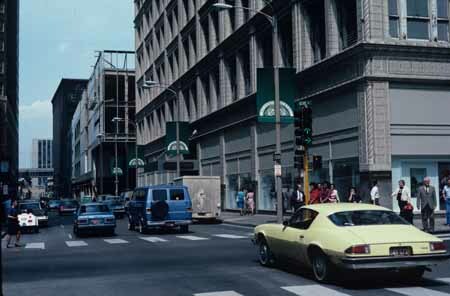 After the 1972 Mercantile Center plan failed to fully come to fruition, with only the Mercantile tower and garage being built west of 7th Street, the quest for a new mall to join Downtown's two remaining department stores continued. May Company briefly toyed with the idea of developing the mall themselves, which would have bee dubbed "May Mall". 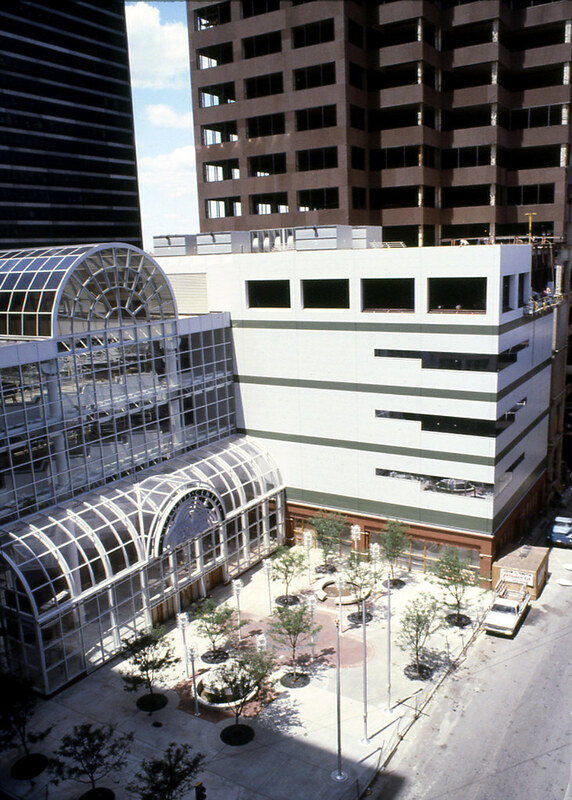 In 1980 however, May Company brought in seasoned shopping center developer Melvin Simon and Associates of Indianapolis as the managing partner of the project. 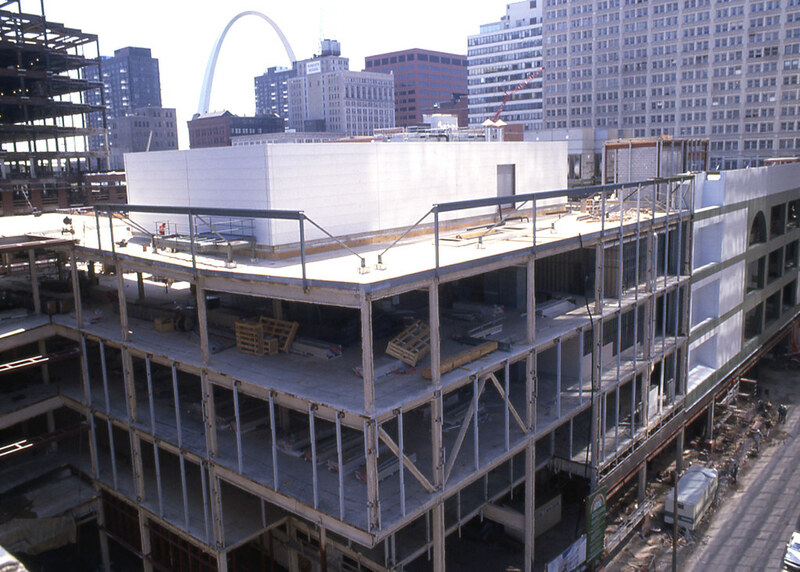 With City property tax abatement and a commitment from the Land Clearance for Redevelopment Authority to finance and construct a six level parking structure at 6th and Locust, Simon moved forward with development of St. Louis Centre. 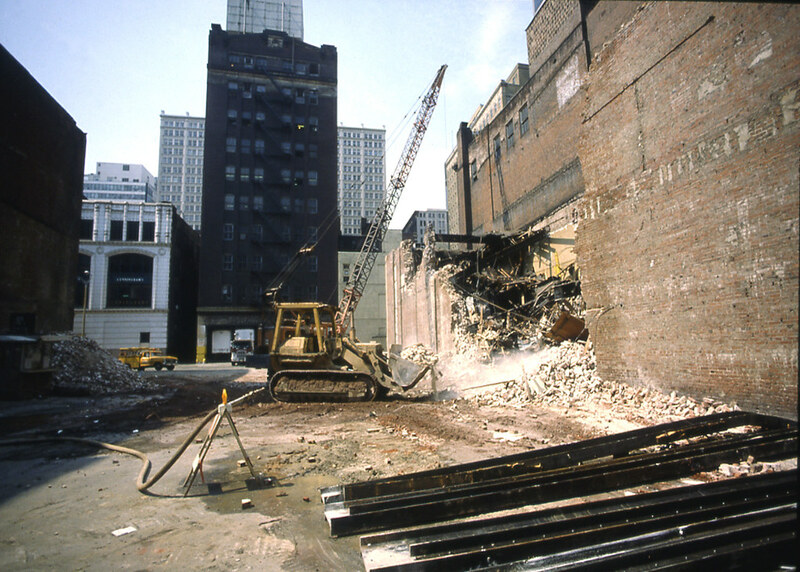 In August 1982 demolition began on the block bounded by Washington, Locust, 6th & 7th Streets. The ten story building in the photo above was the annex to the Famous Barr department store (now Macy's) which is seen beyond. 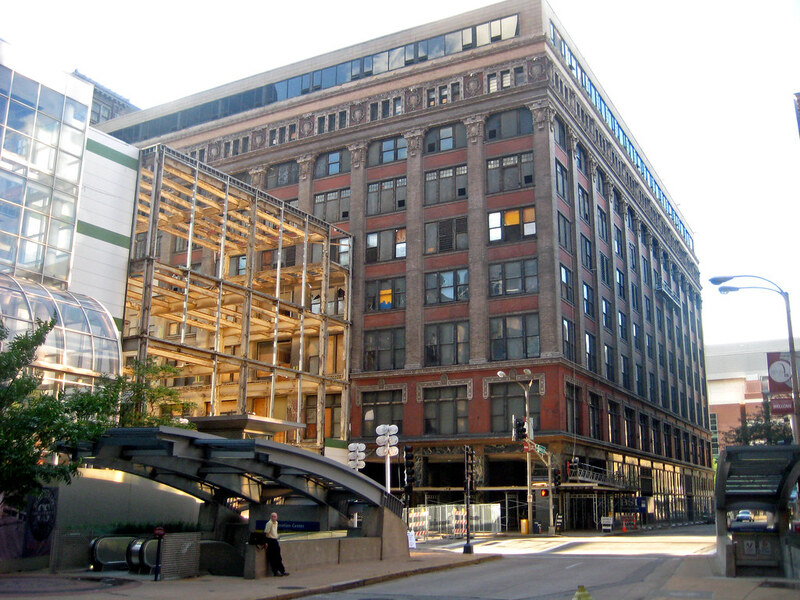 The massive Railway Exchange Building which was constructed in 1914 to house the then recently merged William Barr Dry Goods Co. and the Famous Clothing Store occupies the entire block and has no visible service or delivery area. 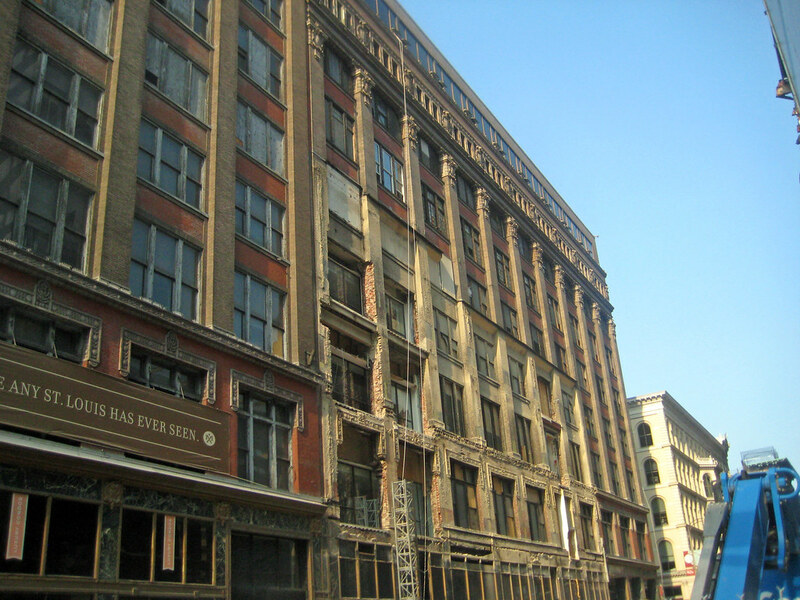 The annex on St. Charles connected to the department store via a tunnel under Locust Street provided the functions of loading and delivery as well as a limited amount of warehouse space. The building also housed the store's boiler plant and air conditioning cooling towers. 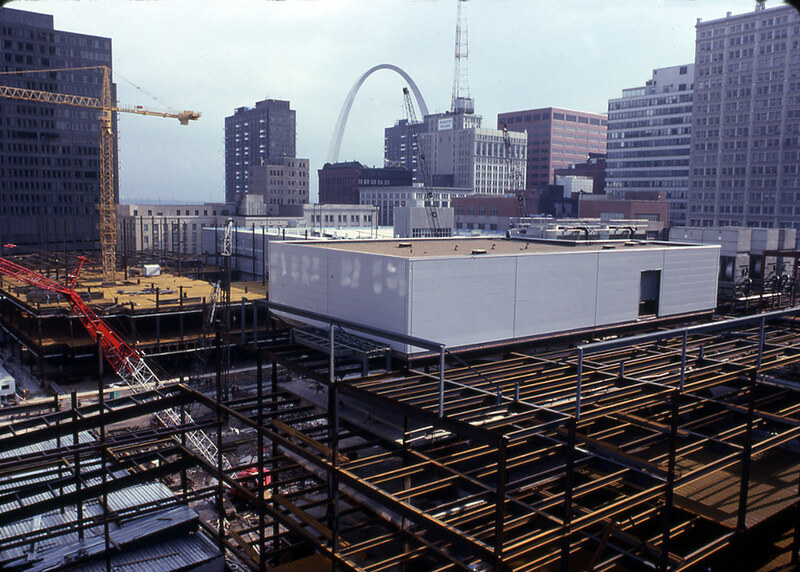 The first portion of the mall to be built housed a rooftop mechanical room and new cooling towers to replace those on top of the Famous Barr annex. 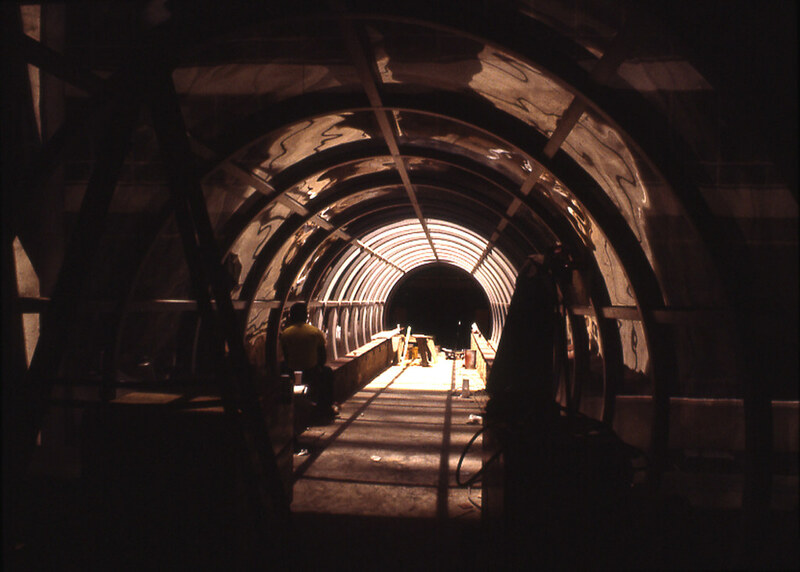 The annex was then demolished down to ground level, leaving the basement boiler plant and tunnel to the store. To this day, all deliveries to and from Macy's come in through the mall's interior loading dock off 7th Street and down freight elevators to the tunnel. 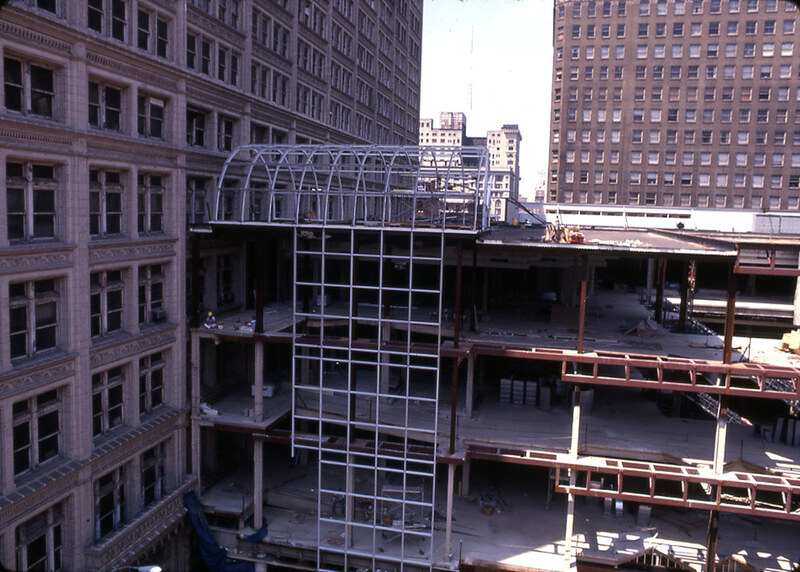 The skybridge at Locust Street attached to Famous Barr, which at the time occupied 10 of the 21 floors of the Railway Exchange. 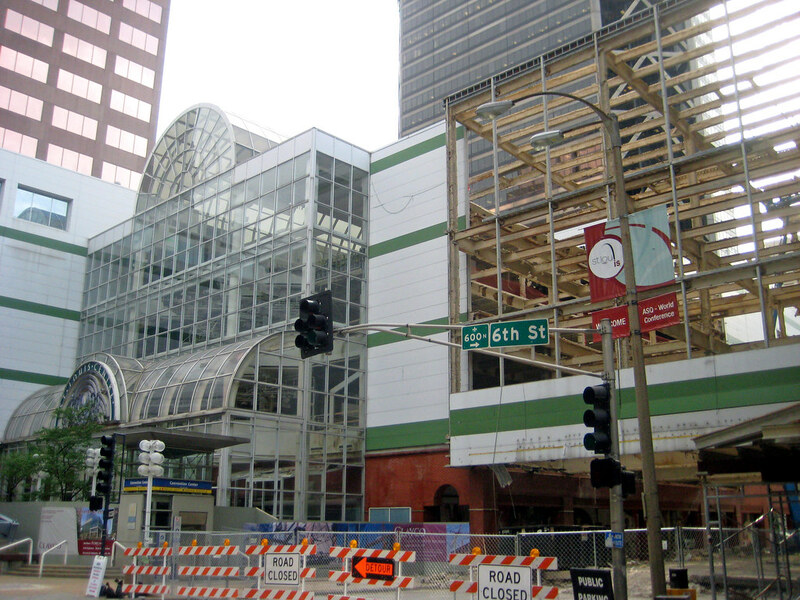 To gain additional square footage in the mall, the wide bridges over Locust and Washington contained retail store spaces. Had the been designed only narrow glass enclosed paths to the department stores, they would have had much less of a negative impact on the streets below. 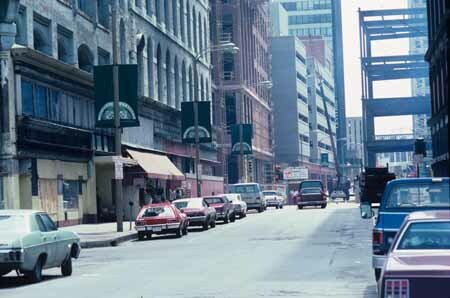 Beyond the mall across 7th street stands the Ambassador Theater building, which would be callously demolished in 1996. 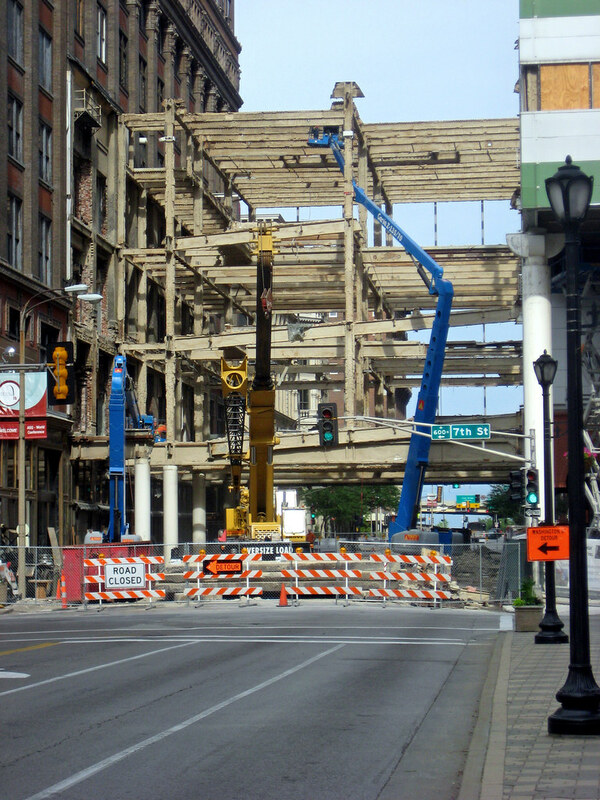 The mall from 7th and Washington almost completely framed out. Beyond, the new headquarters for Edison Brothers Stores, Inc rises on Washington between Broadway and 6th Street. 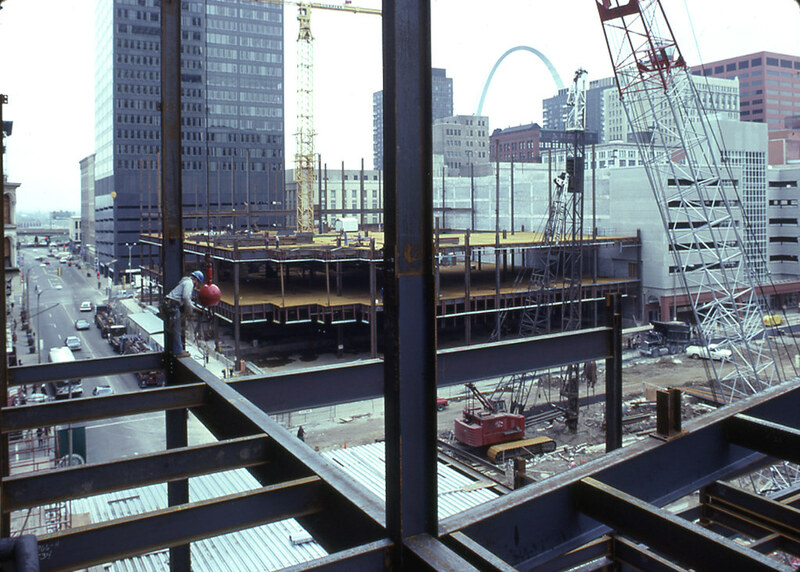 St. Louis Centre and Edison Brothers were part of a Downtown building boom in the early half of the 1980's that also included the Southwestern Bell tower, One Metropolitan Square, Gateway One, as well as what would become Downtown's other mall, the renovation of Union Station. 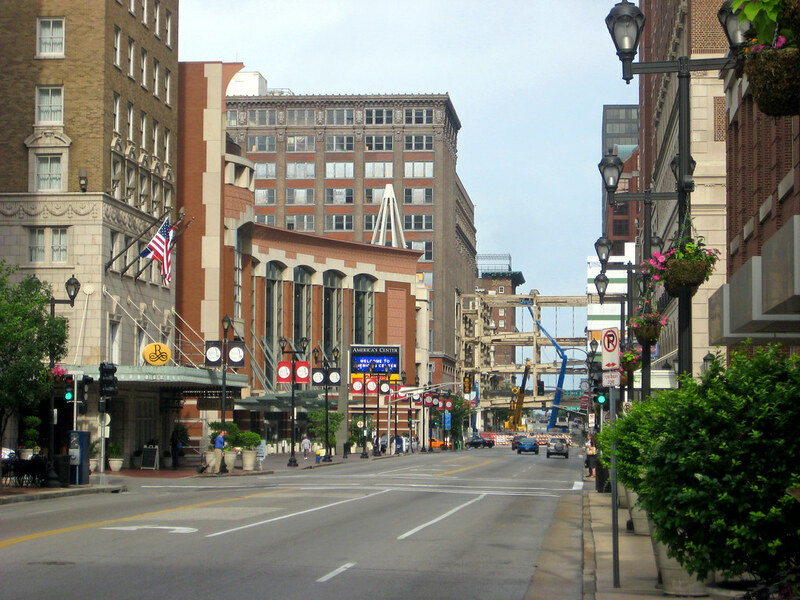 The invasion of 6th Street: this view shows how dramatically St. Louis Centre and the accompanying One City Centre office tower pushed out of the envelope of the super block bound by Washington, Locust, 6th and 7th. The mall contained 350,000 square feet of retail space, which combined with the department store anchors totaled 1.5 million square feet of retail sales floor area. According to Lion of the Valley, this made St. Louis Centre the largest enclosed urban shopping mall in the country. The mall begins to receive its white metal panel skin. 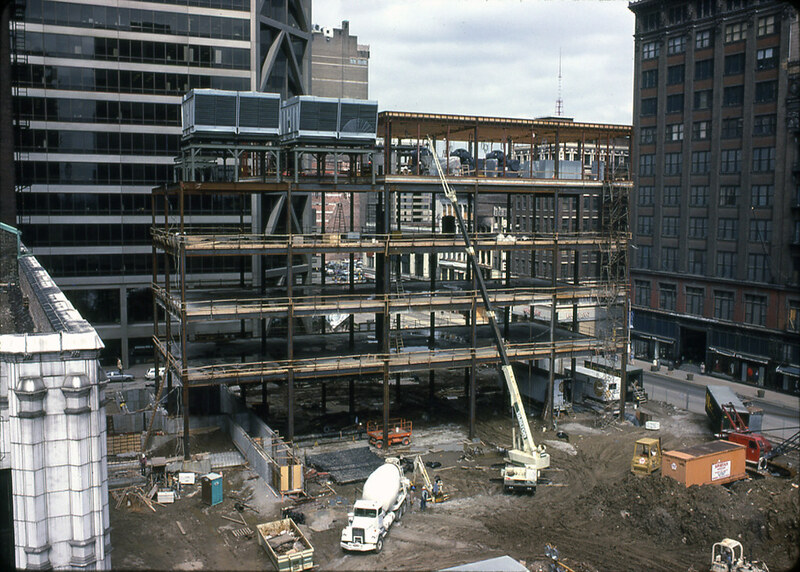 A pair of "Habitrail" tubes connected the mall and One City Centre office tower to the new LCRA garage across 6th Street as well as to the Mercantile Tower across 7th. The network of bridges and tubes resembled that envisioned by the earlier Mercantile Center scheme. 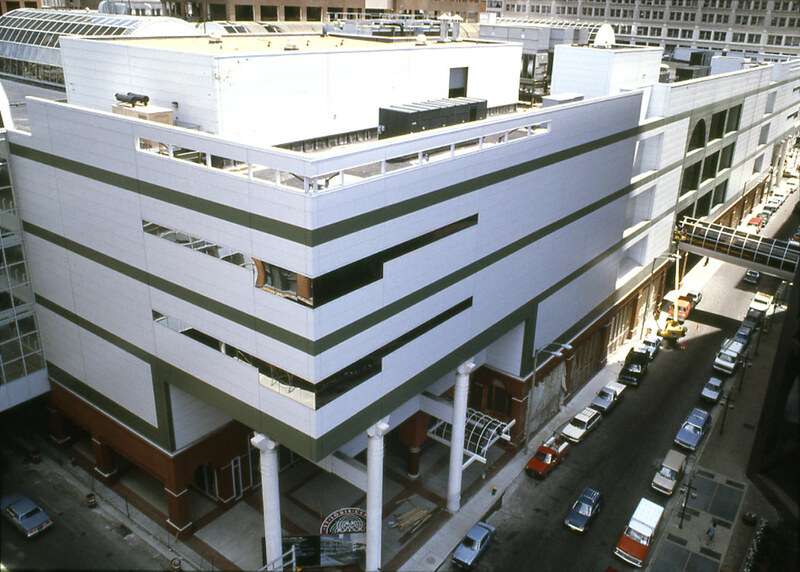 The Crystal Palace inspired glass atrium and entrance plaza at 6th and Locust Streets. The One City Centre office tower is topped out. It was the last portion of the complex to be completed. 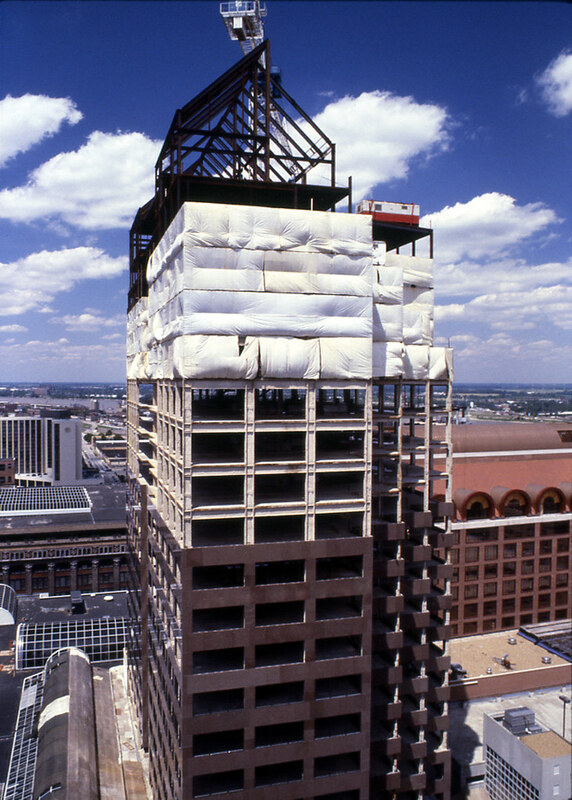 Beyond the Stix Baer & Fuller building is the Sheraton Hotel that was demolished in July, 1992 to make way for the domed stadium addition to the convention center. 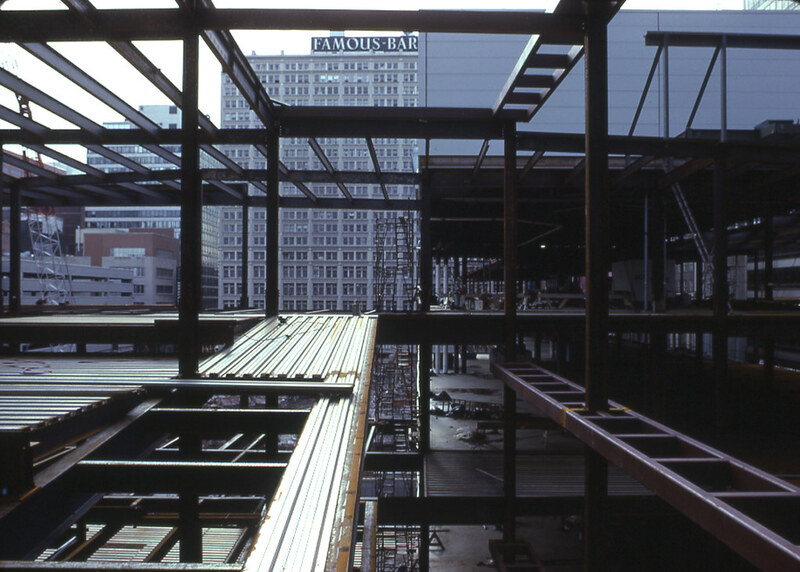 The 600 room hotel had been built in 1977, the same year that the original Cervantes Convention Center opened.